THANK YOU for investing in our lake sturgeon research, conservation, education, and habitat enhancement. Your membership investment and contributions allow us to offer programs instrumental in preserving, what we believe to be, Michigan's most unique aquatic species. By standing together, we are able to create a brighter future for the prehistoric Lake Sturgeon. Memberships run from January 1st through December 31st. SFT has nearly 200 members. SFT is a proud affiliate of the Michigan United Conservation Clubs (MUCC), the Black Lake Association, the Black Lake Sportsman's Club, the Cheboygan Area Chamber of Commerce, the Indian River Chamber of Commerce and the Black Lake Sturgeon Shivaree. Please join us in our efforts to secure a brighter future for the majestic lake Sturgeon. Your membership investment and contribution is the lifeblood of this organization and aids in the implementation of the many important programs initiated provided through SFT. Meaningful work is ongoing through the Sturgeon Guarding Program, Guided Tours, Outreach and Education, Collaborative Research and Hatchery Operations, Habitat Improvements and monitoring, advocacy as well as supporting the development of Sturgeon in the Classroom. In 2016 we established a new dues structure but our devotion to the sturgeon has remained constant. The base membership is $25 and a membership card and annual membership sticker will be sent to family renewals at all levels. 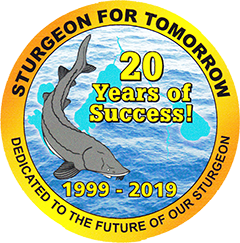 A subscription to our Sturgeon General newsletter will be provided to each member. A renewal at the Partner level of $50 to $99 will also receive recognition in the Sturgeon General newsletter and on our website. A renewal at the Leader level of $100 to $499 will receive membership card and sticker, a subscription to the newsletter, recognition in the newsletter and a solid pewter Sturgeon For Tomorrow key fob. A renewal at the Sustainer level $500 and above will receive all of the above plus a Guided Sturgeon Viewing Tour.